*The CANGYM Program is currently undergoing a complete program revitalization. 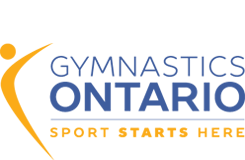 Gymnastics Ontario will provide information to member clubs as it is available from Gymnastics Canada. To order 2008 CANGYM materials (manual and badges): Gymnastics Ontario is no longer taking orders for these materials. Member clubs can order directly from the supplier (e-mail gfa@gymnasticsontario.ca for instructions). The CANGYM National Badge Program is Gymnastics Canada’s National Skill Development and Evaluation program for Men’s and Women’s Artistic Gymnastics. This program is intended for use with participants of varying abilities aged 6 and older, including beginner level participants through to entry level competitive gymnasts. Utilizing the CANGYM badge program allows participants, coaches, and parents to monitor progress in addition to being a motivational tool for athletes. The CANGYM program includes 3 levels (Bronze, Silver & Gold) of skill progressions based on Gymnastics Canada’s FUN, FITNESS and FUNDAMENTALS Educational Philosophy, which helps to create a friendly and stimulating environment for all participants. Each level consists of 4 badges for a total of 12 different coloured badges that participants receive upon successful completion of that badge. Within the Bronze level there is a focus on mastering fundamental movement patterns. Within the Silver level, the focus is on mastering fundamental skills on Men’s and Women’s Artistic apparatus, while the Gold level focusing on mastering the identified target skills. The CANGYM Program binder is bilingual and comes complete with 5 distinct badge description sections outlining the skills in each level, and also includes original Participant Evaluation Forms and Progress Reports, along with Certificates of Participation and Completion that can be given to the participants. In addition, the CANGYM program includes a selection of Sample Coach’s comments and Routines which coaches can utilize near the end of the term. This program can be adapted to a wide variety of age groups and abilities, and, paired with an enthusiastic coaching staff will help your club develop skilled and confident gymnasts.